Asutosh Museum of Indian Art, the first public museum in any university in India, was established in 1937. Named after Sir Asutosh Mookerjee, the great educationist, who introduced the study of Indology including Indian art and archaeology at the university level, this Museum stands for preservation, presentation and study of objects of Indian art and antiquity particularly of eastern India. From a humble beginning with only 5 objects, the collections, thanks to the endeavours of Sri D.P. Ghosh, the first Curator and a number of benevolent donors and selfless workers, the museum has swelled to contain more than 25,000 items consisting of sculptures, paintings, folk-art objects, textiles, terracottas, etc. of extraordinary variety, providing a wide panorama of cultural endeavours of the people throughout the ages. Since its inception, the Museum had to change its location more than once. Originally, the collections were housed in the rear portion of the old Senate Hall from where the portable exhibits were shifted to Murshidabad Imambada and heavy stone sculptures were deposited underground in 1942, due to the threat of bombing during world war II. The collections came back to their old location after five years only to be shifted again in 1960, to make room for its new building. Having sojourned in a temporary home for seven years, the Museum returned in 1967 to the newly constructed Centenary Building of the University where the ground and first floors accommodate the galleries, maintenance and administration of the establishment. Dt. 24 Parganas C. 1st Century A.D. The Museum has not only gained an accommodation befitting its utility and stature but has also earned a reputation as being a premier museum of national importance. Soon after establishment, the Museum organised a certificate course in Art Appreciation. The publications of the Museum include useful books on preservation, reports on excavation by the Museum and handbooks on Bengal sculpture, terracottas and coins in its collection. Several sets of coloured and monochrome postcards have also been issued for sale. In 1959, the University of Calcutta instituted a Postgraduate Diploma Course in Museology and the Museum served as the base and a working laboratory for this course. Dt. W. Dinajpur C. 1st Century A.D. The visitor enters the Museum through the foyer in the ground floor. To the right is a large hall, dominated by a row of majestic sculptures, all collected from different parts of Bengal. Among these sculptures, a Vishnu Vasudeva in black basalt from Jessore stands at the far end while the alcoves of the left wall accommodate a few unique figures representing different iconographic forms while an enigmatic royal bearded figure in noble gait commands the entrance, standing beside an enormous Makara belonging to early medieval period. Next to the entrance is the main hall with its extensive floor space devoted to the exhibition of bulk of the stone sculptures of the richest variety, mostly collected from different parts of Bengal, Orissa and Bihar. There are also objects of terracotta and coins, seals, beads and other antiquities found as a result of excavation carried out over a long period. On the right side from the entrance door are arranged chronologically, upon pedestals and in showcases, stone sculptures dating from about first century B.C. right up to recent times. Bulk of the sculptures belong however, to the Pala-Sena period visualizing the artistic development in Bengal and Bihar in early medieval period. Among the sculptures of earlier date, mention may be made of a head of turbaned Dwarapala from Udaygiri, Bhuvaneswar, Orissa (c. 1st Century B.C. ), a headless male figure with a staff in hand, probably of Kartikeya from North Bengal (c. 2nd century A.D.) and a small mutilated red sandstone Kushana-Mathura type Buddha from Chandraketugarh. These specimens are quite noteworthy for their iconographic and artistic characters. Some Buddhist sculptures from Sarnath and a few architectural slabs (5th-6th century A.D.) displaying restrained and poised ornamentation and balance represent workmanship of the classical Gupta style. Equally important is a remarkable Surya figure from Kasipur, West Bengal of 6th - 7th cent. A.D. showing the continuation of classical Gupta style in eastern India. Dt. 24-Parganas C. 7th century A.D. The Eastern School of medieval sculptures is very richly represented here through quite a large number of attractive images, some of them of unique importance, such as the image of Vishnu riding on Garuda and the head of a lady, from Agradigun, West Dinajpur, a figure of Harihara from Bihar, a torso of Vishnu from Jatardeul, a double sided medallion envisaging Vishnu dancing on Garuda, within Sudarsana Chakra from Sarisadaha, 24 Parganas, an extraordinary image of Kartikeya from Kaligram, Rajshahi, Bangladesh, Rishabhanath from Purulia, Manjusri from Bhangor, Saraswati from Sundarban, etc. The sculptures very significantly portrayed are gradually unfolding of the style of Pala-Sena period, rich in conception and varied in ornamental detail. Besides these, there are examples of sculptures from different parts of India providing a comprehensive idea of the contemporary lithic art developed in India during the medieval age. In ancient India, the Prāchyades'a or the ‘Eastern Quarters' encompassed generally the country lying to the east of Varanasi. Roughly speaking, the territory corresponds to the modern states of Bihar and Bengal, and parts of Orissa, Nepal and Assam. The Prāchyades'a, however, was not merely a geographical expression. Political developments since the early days had led to the integration of a large part of this region and had contributed to bringing into existence a broad unity of culture which was also echoed in the manifold arts of eastern India. The development of art in eastern India has a long history. 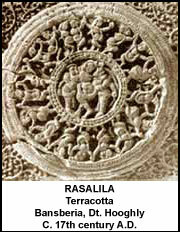 For nearly a millennium from the third century B.C., it moved along with the main stream of development of art in India. The ideal of pan-Indian sovereignty as embodied in the governments held successively by the Mauryas , the śunga- Kānvas (c. 180-30 B.C. ), the Kusānas (c.78-175 A.D.) and the Guptas (c. 318-550 A.D.), was the chief protagonist inspiring a broad unity of style in the sphere of art. Unfortunately, the extant specimens of lithic art belonging to this early phase of history are sparse in eastern India, but a very large number of terraotta sculptures unearthed at different archaeological sites adequately demonstrate that the artistic activity of the region was far from negligible even in as early a period as the third century B.C. Some specimens collected in this Museum have definitely pushed back the traditions of Eastern sculptures to a much earlier date and have made the regional variations in Bengal sculptures evident to the discerning eye. The sharp and well-chiselled sculpture of Varendra can now be distinguished from the graceful and rhythmic form of the figures found from Vanga and Samatata. To the left of the hall, right from the entrance, are arranged within wall and table cases the manifold types of terracottas, seals, sealings, ritual and votive objects, coins and other antiquities, found from different places of Bengal and regions around. The unique terracotta collections of the Museum are indeed records of fascinating skill and reveal an amazing continuity of the artistic traditions in Bengal from a very remote age. Most of the early terracottas and other antiquities were unearthed from various noted archaeological sites of Bengal like Chandraketugarh, Harinarayanpur, Tamluk, Panna, Tilda, Bangarh, Mahasthangarh, Paharpur, etc. This collection also includes some rare terracotta specimens from different north Indian sites such as Patna, Kumrahar, Nalanda, Ahichchhatra, Kausambi, Rajghat. Apart from the large number of early terracottas belonging to Maurya, Sunga, Saka-Kushana and Gupta periods, the burnt clay and bricks depicting various stories from the epics and mythology, usually used for the decoration of the facades and outer walls of the temples of Bengal in late medieval periods reveal a wide repertory and an extensive variety of terracotta work of Bengal. Among the early pieces, mention may be made here of a supple and willow Yakshini from Bangarh. Not only are the Terracotta collections characterized by an abiding aesthetic appeal, they are also distinguished by a wide range in theme and subjects. In this section the seals and sealings depicting various animals, symbols and scenes of love and also pictographs largely add to the curiosity of the visitor. The temple plaques of late and medieval period are narrative in content and are characterized by rare boldness and vigour with emphasis in details. Gosthalila from Bakreswar, Birbhum; Rasalila from Bansberia, Hooghly; Indrani riding over its Vahana the elephant, from Faridpur, Bangladesh; a hunting scene from Naldanga, Jessore, are a few among the noteworthy examples that may at once attract the visitors’ eyes. In this particular gallery, the visitors may also find systematic display of the various excavated objects and antiquities, so far discovered from such ancient sites like Bangarh and Chandraketugarh. From the ground floor across the spacious exhibition area and the lobby, the visitor is welcomed by the grand staircase to the first floor of the Museum. Here one finds large copies of ancient Indian and SriLankan mural paintings on the outer wall of the main hall, while inside, folk-art, paintings, metal and wooden sculptures are on display. In the main hall here, almost the same size as the sculptures gallery below, have been displayed the rich collections of folk-arts as also textiles mainly from Bengal and Orissa, colourful and mystical banner paintings from Tibet and Nepal and numerous paintings of the Mughal, Rajasthani, Pahari and local styles. On the left side of the hall from the entrance are arranged systematically within cases Pats (scroll paintings), painted Saras, popularly known as Lakshmi Saras, Pata (manuscript covers with paintings), Kantha (embroidered textiles), folk-toys, dolls and ritual objects of wide variety and interesting details. Distinguished by vigorous lines and vivid colour, the scroll paintings depict subjects from legendary tales, epic cycles relating to the life study of Krishna, Rama, Sri Chaitanya and others. A tiger in the Gazipat or the narrative of Kamale-Kamini depicting Chand Sadagar in his maritime quest or a Bhumij woman in the afterworld reveal the pleasant character in their inane simplicity and boldness. The earliest known examples of the Pat style is to be seen in the illustrated Ramayana manuscript of Tulsidas, dated A.D. 1772 recovered from Midnapur. The exhibits in this hall in their wealth of variety not only give a highly entertaining feast in colour but also reveal, while strictly depicting the locale, a distinctive flavour enriched by the eastern tinge. In its continuous recurrence in the field from the time of the Palas, painting has been in Bengal a well cherished tradition that has continued for long and can be traced in manuscripts, in manuscript covers in wood, on scrolls and other variety of pats and paintings in Murshidabad, Krishanagar and Kalighat style, all of medieval and late medieval age. In the allied fields of cultural activity there have been toys, dolls, ritual objects, textiles, Baluchari saris, kanthas, dance masks and varied other items which would entice one to enter a forgotten world of colour nuances and ecstasy. The array of painted wooden manuscript covers collected from Bengal and Orissa reveals a style of uncommon interest. While Bengal's tradition is characterized by the dramatic action and sensitiveness, those from Orissa are more lavish in colour and decorative details. Kantha, known as the embroidered quilts done by the rural women-folk of Bengal out of discarded cloths, is marked by linear figure works, varied motifs and coulourful back-ground. Examples from Jessore and Khulna from Bangladesh are particularly noteworthy for their neat workmanship and rare beauty. On the rear wall of this gallery are to be seen examples of magnificent textiles from Baluchar, silken fabrics of early 19th century, endowed with dexterous figure work and deep and variegated colours. The Kalighat painting themes were very popular those days. A few outstanding examples of these paintings have been displayed along with contemporary paintings on paper and cloth from Orissa. Dolls and toys of all varieties and of such materials as clay, wood, pith, cloth, paper, etc. constitute the collection of folk-art and reveal the artistic endeavours of the common people. Of these, a cult figure depicting mother and child from Goalpara, Assam and a wooden doll, probably representing a noble lady from Dhaka, Bangladesh may be mentioned for their rare craftsmanship and significance of design. A unique illustrated paper manuscript dated A.D. 1105 from Nepal (perhaps the earliest known paper manuscript) happens to be a rare specimen of antiquity in the Museum, showing the Eastern Indian School of painting in a highly mature state. This manuscript is exhibited within a table showcase along with a representative collection of rare paintings, illustrated paper and palm – leaf manuscripts all collected from eastern India and Nepal. 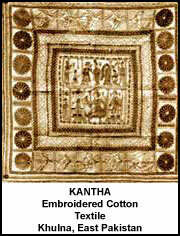 In this section are also a number of paintings on textile from Rajasthan, Gujarat and the neighbourhood. The grandeur and pomp of the court as well as the royal life of the Mughals, who came from Central Asia, are beautifully illustrated in the Mughal paintings arranged chronologically on display screens set up as a separate inner wing of the main gallery. In this wing may also be found selected Rajasthani and Pahari paintings of extraordinary beauty, endowed with rich and glowing colours, full of religious fervour, devotion and love. Rare and noted examples of paintings of such important post-Mughal local schools like Oudh, Patna, Murshidabad, Nadia, Burdwan, etc. are also displayed. The visitor is next invited from here across a corridor, to the gallery of wood and metal sculpture situated in a spacious room bathed in north light. Apart from some very interesting metal images belonging to the Eastern Indian School, rare specimens from Nepal and Tibet as well as from Orissa enrich the collections in this room. Along notable metal images mention may be made of a syncretistic image of Siva Lokesvara from Barisa, Bangladesh, a Vishnu standing in Samapadasthanka attitude from Sagardighi, district Murshidabad and a seated Buddha from Jhewari in Chittagong. An important copper plate inscription of Dommanapala, a ruler of Khadi Mandala, discovered from Sundarban and dating back to A.D. 1196 with a figure of Vishnu seated on a chariot with a devotee kneeling in front engraved on the reverse, has been displayed in an island showcase of this gallery. The rich tradition of Nepalese metal casting finds represented in the numerous images of Buddhist and Brahmanical deities, a tradition that has continued to survive till the present age. Orissa, a land of temples, has never neglected the medium of metal casting, the evidence of which may be found in such subtle works as the figures of Krishna Radha, Bal Gopala and nāyikās displayed in this gallery. A few notable metal pieces in Western Indian tradition and of Jaina faith add to the variety of the collection. Dt. Barisal, East Pakistan C. 10th century A.D. The rarest wooden sculpture of the Museum happens to be a beautiful standing figure of Gopala of 16th century A.D. found from Malda, now in the round, records the mastery of the artist in creating an unimaginable form of delicacy and softness. The carved wooden brackets from South and Western India, originally used as corner support for thatched huts or wooden structures are crowded with battle scenes having human and animal figures, creepers and foliages. A lot of carved wooden chariot figures of Nâyikâs, Mendicants, Bal Gopala, Sages, etc. from Orissa and Bengal, not to speak of some monumental animal and human representations, have an equal importance in relation to its artistic renderings. In conclusion, notice of the visitor may be attracted also to numerous miscellaneous items including ivory works, bidri works, metal wares, glass, etc. that enrich the collections of the Museum, including an ivory royal hunting scene from Orissa (c. 17th Century A.D.) of unparalleled workmanship for which ivory carvers of India had been famous through out the ages. The activities of the Museum are varied and manifold. Though open to the public, being a University Museum, its first responsibility is to provide academic support to the teaching faculties of the University, and the students of Ancient Indian History & Culture, Museology, Sanskrit, Pali, Islamic History, Bengali and the like and also to students carrying out research in different fields of Indology. The Museum also provides guide services to organised visits from educational institutions, has an excellent library consisting of books on art and culture, holds lectures and exhibitions for popularising art and archaeology and undertakes all museum work for public edification. Its picture postcards are available to the public for sale at a nominal price. After the visitor has gone through the galleries and taken a dip into the traditions of art and culture of the country, particularly of Bengal, the Museum would like to bid him a hearty goodbye and a warm invitation to come back again. At the entrance the visitor should enter his name and address in Block letters and declare in writing that no commercial use of the photo prints will be made and also supply particulars about the CAMERA with which he intends to take photographs. The number of objects to be photographed is to be stated clearly in the application for the purpose. A fee of Rs 200 (Rupees two hundred only) is charged for the use of Camera with or without stand for each shot of approved ‘Museum Objects’: The amount should be deposited before photographs are taken. The use of flash-gun or use of strong light for photography which may have injurious effect on the paintings in the Galleries is strictly prohibited. Exhibits must not be touched or removed from their position for the purpose of photography. No photograph will be allowed to be taken unless a representative of the section concerned is present. Photograph should be taken in such a way that no obstruction / inconvenience to other visitors is caused. The Curator of the Asutosh Museum reserves the right to disallow, at his discretion, the photographing of any particular object or group of objects. Acknowledgement of the courtesy of the Asutosh Museum of Indian Art, Calcutta University should be made prominently and preferably in each plate. Selection of Photographs intended to be published should preferably be restricted to published materials, and subject to the approval of the Curator. Payment of a reproduction fee of Rs. 100/- (Rupees one hundred only) for each plate for academic publications, e.g. Books, Articles, Journals, etc. Supply to the Asutosh Museum, free of cost, 2 copies of the reprints of Articles or Publications in which the reproductions appear. A fee of Rs 1000 (Rupees one thousand only) is charged for the use of a camera with or without stand. A fee of Rs 5000 (Rupees five hundred only) is charged for each shot of approved Museum objects. The amount should be deposited before photographs are taken. Other conditions are as noted above under 1,3,4,5,6,7,8 a - b.
Reproduction of photographs for lawful commercial purpose is permissible subject to the following conditions. Fees for reproduction of photographs for each item: Rs 1000 (one thousand only). Other conditions are as noted above under 1,3,4,5,6,7 & 8 a – b. The Vice-Chancellor or the Pro-Vice-Chancellor for Academic Affairs may waive part or full of the requisite fee at their discretion. Visitors desiring to make sketches of the Asutosh Museum building or of Museum objects in and outside of the building will be required to apply in writing for permission to the Curator. Students from Art Colleges, schools or Institutions, while applying for permission, must produce letters of recommendation from heads of Institutions in which they study. No object should be removed or shifted from its place, nor taken from a case for the purpose of sketching. No obstruction should be caused to other visitors in the Galleries while sketching. Other conditions as stated above will prevail. Application for shooting Museum objects is to be made 45 days before shooting in writing to the Curator, specifying the objects for which it is proposed, indicating the Gallery / objects to be filmed and stating the duration and time schedule for the shooting. Decision on such application should be taken by the Vice-Chancellor in consultation with the Pro-Vice-Chancellor for Academic Affairs. No unpublished material will be allowed for filming, except with the prior approval of the Pro-Vice-Chancellor (Academic Affairs). Filming of fragile or large-sized object or objects susceptible to unfavourable reaction on exposure to very bright light is prohibited. Acknowledgement of the courtesy of the Asutosh Museum of Indian Art, Calcutta University should be made formally. The curator reserves the right to disallow at his discretion, the photography of any particular object or group of objects, without assigning reasons. A 16 mm copy of the film is to be supplied, free of cost, to the Curator of the Asutosh Museum for educational purposes. If the office staff is required to work outside office hours to assist in the filming operation, the producer will pay in cash through the Curator overtime allowances due to the staff concerned at the prescribed official rate. No equipment and furniture will be provided by the Curator. During the filming operations no damage should be done to the Museum objects and building and furniture. Any damage, if done, will have to be compensated for as determined by the Curator. No shooting will be permitted without prior sanction issued in writing and without payment, in advance, of the requisite fee indicated below and without fulfilling conditions as laid here-in-under. Fee for films and documentaries sponsored by educational bodies /institutions of Central/State Government for educational purpose in respect of Museum objects of Galleries or interior structure of the Building : Rs 5000 (Rupees five thousand only). Payment of a fee of Rs 5 lakh in advance for any one select subject. Filming will take place on a date and hour to be fixed for the purpose by the Curator. Acknowledgement of the courtesy of the Asutosh Museum of Indian Art, Calcutta University should be formally made. The complete script should be submitted to the Curator for consideration of the University authorities. The filming operations are to be carried on in such a way that no disturbance is caused to the visitors. The applicant will have to change his programme if the Curator apprehends any such disturbance. If necessary, the permission may be cancelled any time without previous notice. The Museum shall not be held responsible for loss, if any, suffered by the producer on account of such cancellation.